This article explains how to enable a COBOL SQL trace on a COBOL process definition. Navigate to PeopleTools > Process Scheduler > Process Types and open the COBOL SQL process appropriate for your operating system and database platform (e.g. UNIX and Oracle). Copy the text in the Parameter List excluding %%PRCSNAME%% (not required). 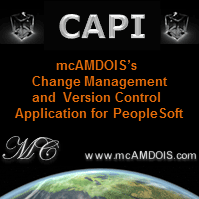 Navigate to PeopleTools > Process Scheduler > Processes and open your COBOL process definition. 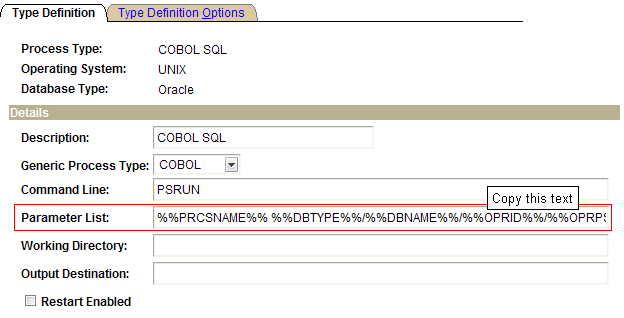 In this example, I've using the PTPDBTST simple COBOL test program delivered with PeopleTools. In the override options, set the parameter list option to override. Run your COBOL through the appropriate run control page. In the view log/trace file list you should see a file with the extension .trc. This is the COBOL SQL trace with timings. There are some really helpful instructional videos on My Oracle Support (you'll need an account) that go through how to do a COBOL timings trace and troubleshoot COBOL performance issues.